Description: Goddess of the cosmic energy in the evolutionary process; Cosmic dancer of dynamic capacities; Mother and upholder of the universe: She Who, as cause, is in the effect; Science, forgiveness, beauty, contentment and retentiveness is She; Ever victorious one; She Who is fame, mind and remembrance - companion, merciful kindness, faith and patience - earth, health, nourishment, the arts and victory; Giver of enjoyment to all things which move and are still; Giver of the fruit of all desires; She Who givest life to all things being as they are parts of Her; She Who slays for the good of those slain that in another body they may obtain fulfilment of their desires; She Who slays for the good of the world for without death there could be no life; Remover of the pains arising from birth; She Who is known by those desirous of liberation as giver of happiness; She Who is not worshipped by those beset with error or of small intelligence. Title of many Hindustani Goddesses Who can be called Jagadamba, just as They are called Devi, and Mahadevi. To Whom Sacred: dance; the three gunas (guna is a cord or string used to bind things together). 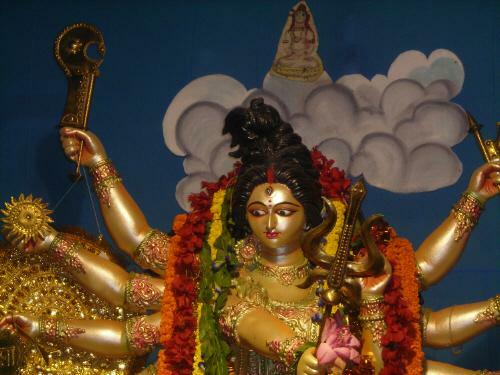 She seems equivalend to Jagad-Dhatri fifth of the ten warrior forms of Durga, Inaccessible-One. Variant of Jaganmatr, World-Mother, below. Variant of Jagadhamba, World-Mother, above. Title: Jiva, Who is linked with Thou, Your-Very-Self. worked on: June 1995; August 1991; July 1990.